CAC 40 - Analysis summary for early 2017-01 through early 2017-09. In this analysis summary, we’ll take a look at the time period from late January 2017 to early September 2017 and see how we did. For much of the year, our structural models for the CAC 40 were off to some degree, and were only saved by our scenario-critical levels, which many times gave appropriate verdicts as to the market direction, rather than the directional analysis (which is usually the most profitable to be correct with…). On the 26th of January and 1st of February, we posted analysis updates which called for a bigger drop than the at the time ongoing correction. This never happened, and the only saving grace was that we specified the 4845 level as an indication that the negative scenario wouldn’t come to pass after all. On the 13th of February, littled had changed, but our analysis now called for one more advance in the CAC 40 to 4930, before a significant decline would follow. 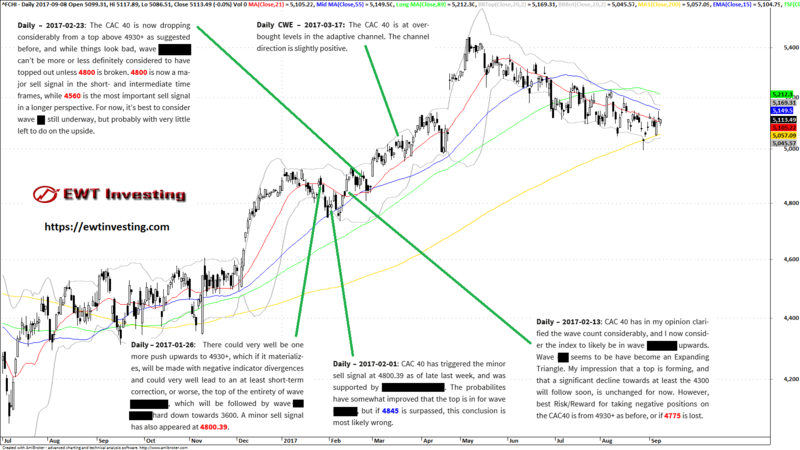 That turned out to be wrong, although the CAC 40 actually hit 4930 – only a minor correction ensued from there. Then on the 23rd of February, we specified that 4800 needed to broken *if* a valid sell-signal was considered to have occured. That did not happen because 4800 withstood the drop the next day, and so the proposed negative scenario didn’t pan out, and the CAC 40 resumed the advance, which was unexpected to us at the time. On the 17th of March we commented that CAC 40 was overbought in the adaptive channel, but the index only corrected minorly, before resuming the advance. Let’s move on and see if we did better in the next few months. On the 18th of April, we posted 5085 as a trigger level for a positive trend continuation, which turned out to be a good signal level. But we still had a main scenario of more downside, which turned out to be incorrect. Luckily our analysis efforts were partially saved by that positive trigger level. On the 9th of May, we made a very good call, commenting that CAC 40 was very overbought and would top out soon. We specified 5000 as a target, which incidentally was reached almost 3.5 months later. Then on the 6th and 13th of June, we warned that the CAC 40 was looking weak and would probably continue to correct, and that the best course of action was to stay away and wait. 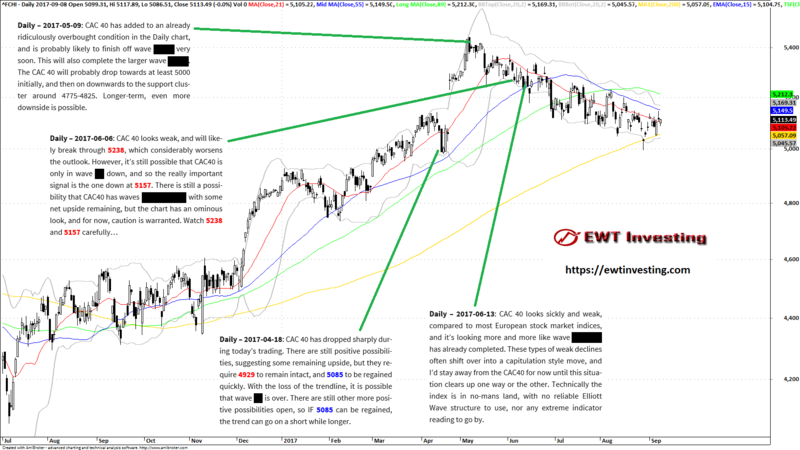 On the 4th of July, our analysis pointed to some possible upside, towards 5400. A few days later, the CAC 40 put in a short-term double-bottom, and rose towards 5250, but failed to follow through beyond that. The market thus proved that conclusion of ours, to be wrong. On the 1st of August we commented that CAC 40 would have to break through 5170 in order to signal that the downtrend was possibly over. But on the 8th of August, after the market having rallied, we warned that if 5130 was lost again, the choppy downtrend would likely resume. That’s what happened, as the CAC 40 extended the correction even further. On the 5th of September, we noted that if 5047 wasn’t lost again, that the bottom could be in, and the uptrend continue. 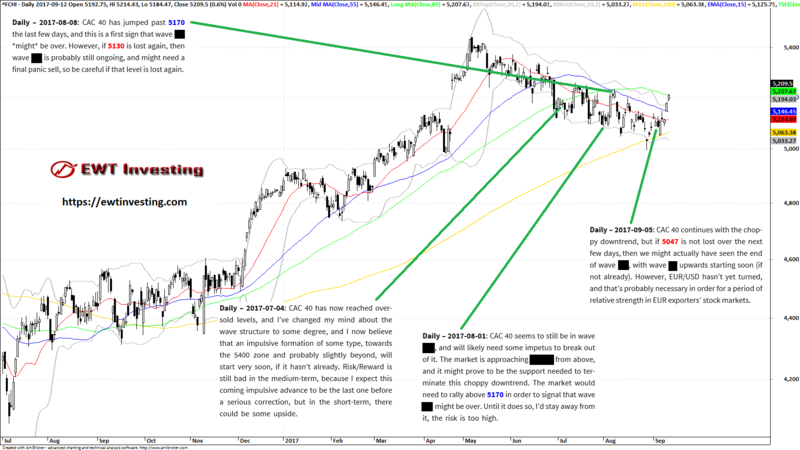 Over the next few days, 5047 held, and the CAC 40 then resumed the uptrend. Overall in the period January 2017 to early September 2017, our analysis work for the CAC 40 was at least partially off the mark. In the beginning of the year, we expected a much shorter rally, and the choppy downtrend proved tough to nail down. The violent post-election rally was to some degree predicted by our analysis, and we did get the initial call for a drop to 5000 from the May highs correct. Our analysis work on the CAC 40 looks like it might be the worst for 2017 of the 20 financial markets we analyze and keep track of. Hopefully, we can get back on track with the CAC 40 for the remainder of the year. Access to the CAC 40 Elliott Wave analysis section is included in the Global Elliott Wave Coverage subscription service.